Five Star Muckross Park Hotel and Cloisters Spa opened its doors as The Herbert Arms in 1795, and was part of the original Muckross House Estate. 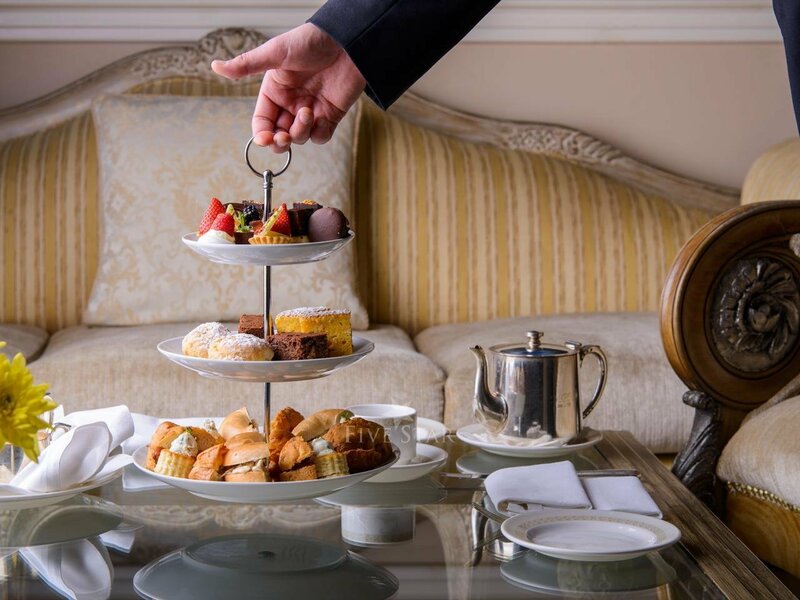 Th..
Five Star Muckross Park Hotel and Cloisters Spa opened its doors as The Herbert Arms in 1795, and was part of the original Muckross House Estate. Throughout its distinguished history, it has hosted many well known guests, including Queen Victoria, George Bernard Shaw and Daniel O’Connell. Overlooked by the stunning Killarney National Park and the Blue Pool River running through the grounds, Muckross Park Hotel is one of the most enviable dining locations in Killarney and County Kerry. GB Shaw's Restaurant is proud to serve the best 28 aged beef in Kerry. Head chef, Mike Hayes, has selected a menu based on seasonal ingredients from the finest purveyors of Irish food, GB Shaws Restaurant in Killarney has earned a devoted following and reputation for prime steak, seafood and game. The award-winning Cloisters Spa, has a historic, monastic theme yet uses modern, world-renowned products. Treatments include massages, facials, laser teeth whitening, manicures, waxing and more. Killarney is the perfect base for experiencing the beautiful Ring of Kerry and the Iveragh Peninsula. It is a wonderful destination for golfing, boat trips and hiking. Thank you for sharing your stay experience at Muckross Park Hotel Cloisters Spa. We will publish it as soon as possible. "Great value and location in Killarney" The Muckross Park Hotel and Spa was - in a word - amazing! I was traveling with my daughter and son-in-law so the apartments fit our needs perfectly. We had separate bedrooms, a kitchen and a sitting area. The spa was wonderful, the restaurants were great and the staff were all friendly, professional and exceedingly helpful. We stayed three nights and wish we could have stayed at least a week...so much to do and the Muckross Park Hotel was a perfect location to enjoy Killarney National Park, the Ring of Kerry, the Dingle Peninsula and so much more. "5 STAR Anniversary Stay" We had the pleasure of staying at the Muckross for a few days over our Anniversary. It was an amazing experience! This hotel is so beautiful…the rooms, the common areas and restaurants. Front desk staff/bartenders/waiters/concierge/spa staff were all top notch! We had a stunning corner room with a huge 4 poster bed with equally stunning views. Lovely turn down service with rose petals on the bed, slippers and robes. One of the reasons we booked this hotel was the spa. I have been in many many spas over the years and this one was the best I have been in! It was breathtaking! The pool was magnificent! They had heated tile loungers, numerous saunas, an ice shower, foot baths, indoor and outdoor hot tubs, lay down jets in the pool. It was never crowded. I just wish they would have stayed open longer than 8:00 pm at night. It’s nice to relax after dinner around 9 or 10 pm. Breakfast in the Yew Tree Dining Room was fantastic! I loved the huge raw honeycomb and honey! We also enjoyed Tea in the Monks Lounge (separate review, 5 star) and drinks in the Bar Snug. When back in Killarney this is my go to hotel and I will recommend it to everyone I know that needs accommodations! "Wonderful experience, lush grounds and amazing staff" The Muckross Park Hotel & Spa was every bit as wonderful as everyone else on Tripadvisor is saying but the people really put it over the top. Every person we dealt with, from the custodial staff to the concierge were an absolute delight to deal with. The cherry on top of the pie was that four weeks after our visit, the glove I lost while in Muckross arrived at my doorstep in San Francisco. I left word with the concierge that I had lost one of my gloves, he recognized it from my description and took the time to mail it to me. This followup and act of kindness made my entire day, I thoroughly enjoyed our time there and wholeheartedly encourage you to visit. We arrived to Muckross Park Hotel after being in Ireland almost a week. Driving up to the property we found the entrance off the main road. Reception is up a few stairs to the left and checking in was an easy and pleasant process. We were upgraded to a suite and found a lovely bottle of wine and chocolates waiting for us. This trip was a discovery trip for Wedaways, a destination wedding management company. So our main focus is to experience the accommodations as well as the event space(s). The room was spacious and had a pullout sofa for a third person. The bathroom was large and had a huge jacuzzi tub and huge sink, but not very much counter space. The under sink shelving was ample, though. The main restaurant serves breakfast which was a great spread and you also can order hot food from the kitchen. In the evening it the fine dining restaurant. The hotel has 2 bars. We ate dinner in the pub restaurant and ate fish and chips which were good. The ballroom in the hotel is a very nice space for meetings. The ballroom in the adjacent building is a fantastic space for a destination wedding. It has a "knights of the round table" ambiance. The foyer has an open mezzanine and the main event space is huge. There is a really cool bar area and 2 fireplaces and windows all around. Wooden floors and beams make it a perfect space for long tables and a dance floor. The windows overlook Kilarney National Park, a 26,000 acre public park in which you'll find Muckross Abbey ~ a fabulous outdoor ceremony spot and/or area for wedding party pictures. Continue down the winding grassy path along the river and you shall find the grand Muckross House. Also picture perfect. "Great location & Terrific stay!" We stayed at the hotel for only one night on our tour of Ireland. The staff was great and the facility is amazing. We did have a chance to spend a bit of time in the lounge, and service was good and prompt. The breakfast was tasty and very fresh. Wish we could have had more time.